Peña-López, I. (2017) “Report. 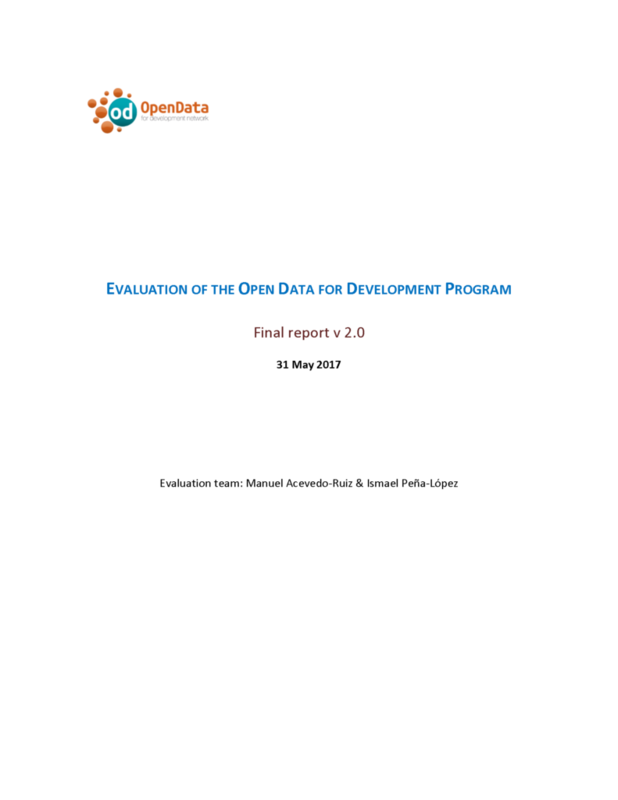 Evaluation of the Open Data for Development program” In ICTlogy, #167, August 2017. Barcelona: ICTlogy. 1. The evaluation didn’t define a baseline to gender work (how much gender aspect should be achieved in the program and why). I also missed something straightforward – what the OD4D see as gender? There are many definitions of gender, but this didn’t come up in this evaluation. of women among partners, grantees (e.g. in trainings) or as participants in the IODC conferences ” However, I could not find the numbers to back it up. In my opinion, gender equity is when there is 50%-50% representation. The official numbers of IODC 2016 are 38% women participation, on 4% rise from IODC 2015. Also, you interviewed 15 women out 50 people in total. These numbers are still far from 50%-50% representation. Did you collect the figures of women in training or grantees? If we want open data for gender equity, we need women at the table to work on this, and currently, women are still not at the table. As the OD4D team acknowledges in their response, the gender issue probably was the weakest one of the program. So, and answering to question #1, that is the problem, that there often was not a gender strategy and, thus, a clear definition of concepts and goals. On #2, note that “presence” means not “equity”. The numbers are in the documents that are listed in the report. But again, we never stated there was equity. Indeed, even if there had been, out point would have been the same: the lack of a clear strategy, regardless the final figures which could have been reached by sheer luck. Regarding #3, IDRC actually has a very good model on gender. We recommend in our report that it is applied by default, as it was not in OD4D. Finally, on #4, mind that the report was not about data or open data, but about the OD4D program itself. Notwithstanding, you will have seen in our recommendations that we do encourage the program to establish more close relationships with national statistics offices, precisely to address the issue you are pointing at: producing more and better data as a pre-requisite to open data.